Saturday November 7 1908 I worked a little in the yard in the forenoon. Will busy about the place. We had dinner early. I went down home at 12.12 Aunt Lib was there for a visit I went to town to come home at 3.30. Jennie & Mr [Shick?] were on the car going to Cedar Rapids Mary had gone earlier to attend a meeting. 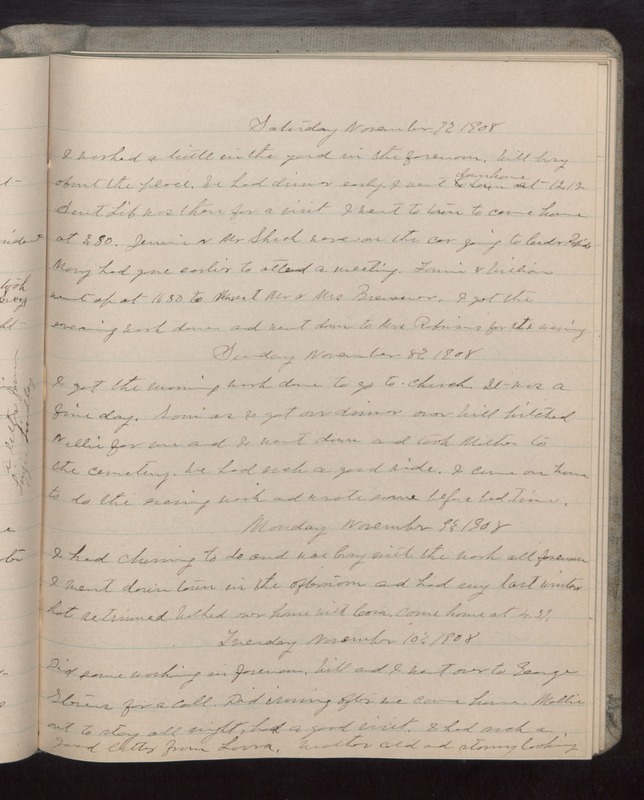 Fannie & William went up at 16.30 to [visit?] Mr & Mrs [Bremer?]. I got the evening work donw and went down to the Robinsons for the evening Sunday November 8 1908 I got the morning work done to go to church. It was a fine day. Soon as I got our dinner over Will hitched Nellie for me and I went down and took Mother to the cemetery. We had such a good ride. I came on home to do the evening work and wrote some before bed time. Monday November 9 1908 I had churning to do and was busy with the work all forenoon I went down town in the afternoon and had my last winters hat retrimmed. Mother over home with Cora. Came home at 4.39. Tuesday November 10 1908 Did some working in forenoon. Will and I went over to George Stevens for a call. Did ironing after we came home. Mollie out to stay all night, had a good visit. I had such a good letter from Lorna. Weather cold and stormy looking.